Aware, Inc. (NASDAQ: AWRE) is a “speculative buy” for investors that are intent on holding equities that provide exposure to the biometric sector. Investment advisor Louis Basenese argues that conservative investors interested in profiting from the biometrics space should consider taking a small position in this company. As recently noted by the Biometrics Research Group, consolidation is a trend that is expected to continue in the biometrics sector. In the medium term, we can expect larger players to acquire smaller firms such as Aware. Aware is a quality target for acquisition since there are very few pure play biometric firms openly traded on public equity markets in the United States. Aware, founded in 1986, provides biometrics and imaging software to capture and verify fingerprint, facial, and iris images for identification purposes. The software is primarily used in law enforcement, border control, access control, and national defense applications. Aware also offers imaging software used to process and display medical images and data. While DSL service assurance systems were once its largest product line, Aware discontinued its DSL hardware business, opting to focus on DSL software, used by broadband service providers to manage DSL networks. The company also has a small intellectual property (IP) licensing business. Aware began as an IP-focused firm whose revenue was primarily derived from government research grants. Aware’s research led to a steadily increasing patent trove and efforts to commercialize the company’s technology. This strategy resulted in Aware housing several different operating businesses over the past two decades as it refined its approach to commercializing its technology. In 1992, Aware became a provider of commercial off-the-shelf, standards-based biometrics software products. The firm’s products enabled solution providers and system integrators with interoperable, standards-compliant, field-proven biometric functionality for applications including credentialing, border management, and law enforcement. Aware continues to build upon this legacy as a leading provider of innovative, high-quality, state-of-the-art biometrics software. Its suite of software tools are included in solutions deployed by product vendors and system integrators, and then used by federal, state, and local government agencies and enterprises around the world. Within the biometric systems product chain, Aware sells component and application software for enrollment and server-based transaction management systems. Beyond the development of a services/consulting business, Aware has also extended the software business toward providing fully developed applications rather than simply producing component parts for applications created by other companies. This migration led Aware to create BioSP, its server-based transaction management system, and other like products that represent more complete application solutions. Aware also has a consulting business that assists with the development and construction of biometric enrollment and analytic systems for governments and other users. End users include the U.S. Federal Bureau of Investigation and other U.S. Department of Justice agencies, the U.S. Department of State, the Department of Homeland Security, and government agencies throughout Europe, Asia, and South America. Running a consultancy allows Aware to create a separate, profitable revenue source while also putting the company in the advantageous position of consulting on projects for which its software solutions serve as component parts (thus increasing the chance of Aware products being used in the systems). Further, the services side of the business serves as a leading indicator of software demand. Aware’s biometric services business targets small projects that larger industry players do not seek based on scale. Conclusively, Aware’s current biometrics strategy is based upon continued growth in professional services and sales of more complete product offerings, both of which provide larger and more profitable market opportunities than a purely OEM-based sales model. Management views 20 to 30 percent annual top-line growth as a reasonable goal for the biometrics segment with the possibility of landing larger projects that would drive 100 percent revenue growth over 2010 numbers. The firm’s businesses and technologies are also varied enough to elicit takeover interest from larger firms. Aware recently saw an increase in its share price after a sale of selected DSL technology patents for US$16 million. 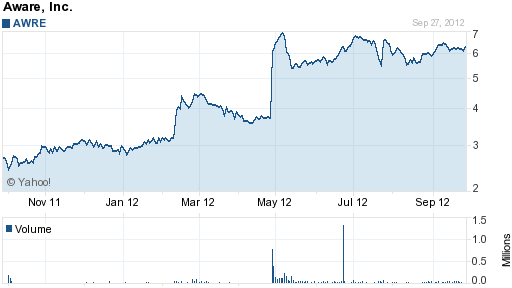 As of September 27, 2012, the stock was trading in 52-week high territory. Biometrics Research Group recommends that you consult an investment advisor before any share market purchase decision.